They were in my first pack. 250a/b - Newly-Dead ED/Dyna-Mike from the 6th Series sold me. Getting some Giant Size series 1 rocked!! Hunting for series 3 by trading as a kid was awesome. Loved 3rd series cards. Finding OS1 and OS2 later was like finding the Holy Grail. It was series 3 for me. I remember really liking Ali Gator and Bustin' Dustin. And I was always proud to have Joe Blow on the top of my stack. Roybot. Series 3 was the first I found. I had quite a few faves as a kid which are the ones that survived and I still have today . My all time faves were Hunted Hunter , Bret Vet , Puzzled Paul and Rob Slob . Topps had me at OS1, but subsequent series up until 5 I'd say really sealed the deal, pulling me in for good. 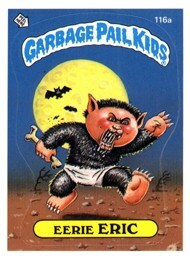 From a child's perspective, when you take into account the strikingly amazing artwork, the clever parody, and the fantastically grotesque nature of the subject matter along with the collectibility of the stickers themselves to the glorified media taboo surrounding the line as a whole, what was there not to like about GPK!?! I was instantly and irrevocably hooked! In my mind's eye, beyond the inherent quality not to mention seemingly ubiquitous popularity of the product itself, the sense of illicitness encircling the characters' depictions made the stickers pure magic and thus my possessing them, "special". OS1 for me too I can remember a few of my older friends buying a few packs and opening them with me I fell in love there and then I HAD TO HAVE THEM but me being me i wanted all of them.. I went out with my uncle and he sent me in our local shop with a £10 note and said he wanted a coke they were 15 pence back then and "get what you like he said" so I did I spent the lot on GPK for some reason they were US cards and not our usual tiny UK cards but were still 12 pence a pack and I can remember to this day my first cards I pulled were... Jay Decay - Blasted Billy - Geeky Gary - Flat Pat and Brainy Janie something I will never forget I was over the moon with the Blasted Billy card from that first pack my uncle was gobsmacked I spent all the tenner but he loved the cards too and soon saw the funny side 23 years later I still love them as much as I did then and now my kids do too. Don't hate me. Chrome is KING! I got started with OS4...that is the first time I started collecting them myself. Some of my older friends had some of series 1 and 2 but they were extremely hard to find around my area. I collected for at least for another year after...the last series I even remember is series 9 and by this time I wasn't really collecting...just picking up a pack here or there if I found any around. I was more into baseball cards so that took most of my extra card collecting money....when it wasn't going to arcade or video games! I can say I really like the look of the 2013 and 2014 series so far. For Me it was OS 1 Drippy Dan, and OS 1 Guillotina. living in conservative south africa it was an eye opener! For me it was OS3 seeing kids showing them off at school and little league. I got excited about them and started collecting them myself. I bought them from local convince stores and the ice cream truck were ever I could find them. But the best part of all was trading them to make a set. OS1, back when it was first released. The whole series hooked me for life. Bought packs all the way until series 15.....never really had in a binder, just stuck them eeverywhere and had sticker books. Fun times. Bought a few random packs all through the years from ANS, FB, BNS and now with 2014 and chrome. In Colombia, South America, where I live, stores only had series 11-15 available. My first pack had Sally Suction, Ripped Fletch and Fritzie Zits. And that was it, Hooked for life! I remember a couple of boys in my condo complex playing with these cards I had never seen before on the sidewalk one day. I stopped to watch them, mesmerized by what I saw. I asked if I could have one and they gave me a really battered Janet Planet. Edges were frayed, card was bent; I still have it too. I was so excited that I went home and asked my dad to buy me these cards. It wasn't until a few weeks later that I came down with the flu and to cheer me up, he bought me several packs. By then, series 3 had been released and those were my first cards. I remember pulling Galloping Glen and Hot Head Harvey. I just loved to look at them. I was 8 years old, and I was hooked. I think for me it was seeing Sy Clops for the first time, but once series 4 came out and I saw Unzipped Zack, I was hooked for life. Every time I look at that card, I'm 10 all over again. 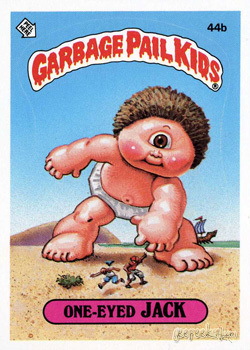 I was 4 or 5 years old at summer camp, when I first saw my first GPK cards a fellow kid brought them in, that's when I first got hooked. Russell muscle had a big impact on me and is my all time favorite character/ memorable one. I first seen these when I was in 2nd grade in 86' man I was hooked from then on. My favorites were 5a Dead Ted & 14a Potty Scotty. I never could get / trade for them because the first series were like finding a hidden treasure to us kids at the time. It's so tough to pick one. I started collecting when OS1 came out and got back into GPKs a few years ago. Seeing Fat Matt again brought back a ton of memories, so maybe that one. Then by Series 5 I was totally obsessed and remember loving Mick Dagger. Cracked Jack is also up there. 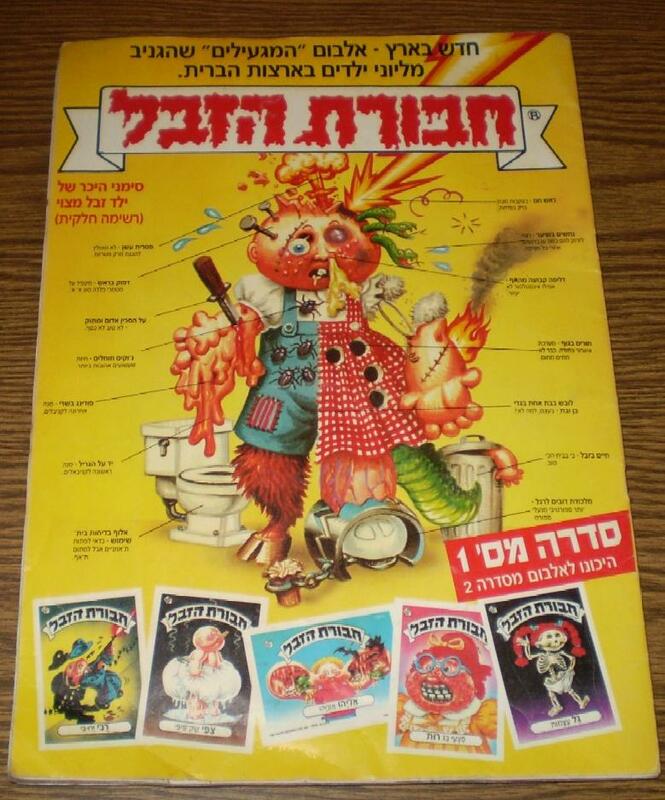 the whole experience of hooking to the GPK started as soon as I saw the first Israeli album. (I wrote about in the Israeli fan set album I made) I was at school and there were these guys that came one day after school and gave to kids the first album + 1 free wrapper to start their collection. as soon as I saw the album I got hooked, it's by far one of the most magical moments of my childhood. it had a look and smell that got may fascination and imaginationright away. these days I'm still looking after this elusive album, and since I dont really have enough funds to get it I'm trying creative ways to to finally get it..